When the Indian Ocean tsunami struck, the only warning most people in the region had was the sight of a giant wave heading towards them. Unlike the Pacific, the Indian Ocean did not have a system to alert residents of coastal areas that a tsunami was imminent. In the aftermath of the disaster, scientists and governments, under the auspices of the UN, began working on an early warning system for the region. One year on from the tsunami, this is a guide to what is planned and what is already in place. Seismic gauges can detect the earthquakes or volcanic eruptions which may cause a tsunami. But as only a small proportion of strong earthquakes produce a tsunami, a warning system based solely on seismic data is prone to producing false alarms. Other sea-based instruments are needed to help scientists decide if a tsunami has been triggered. These fall into two main types: pressure recorders in the deep ocean and tide gauges monitoring sea-level at the coast. 1. Recorder on sea bed measures water pressure every 15 mins - an unusual result triggers a reading every 15 secs. The Deep-ocean Assessment and Reporting of Tsunami (Dart) system uses buoys and sensors stationed far out to sea. A pressure recorder on the sea bed measures the weight of the water above it - which varies according to wave height - and sends its findings to a buoy on the surface. The buoy monitors the surface conditions and sends this, plus the data from the sea bed, to a satellite which relays it back to a receiving station. 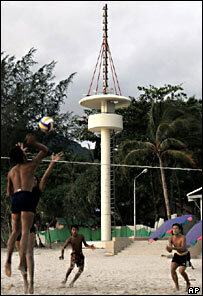 Germany is working on a joint project with Indonesia to put in place 10 of these buoys, the first two of which were installed in November 2005. India, Thailand and Australia are also planning to install Dart buoys along the Sunda Trench, the site of the earthquake that triggered the tsunami. The advantage of the Dart system is that it can detect tsunami far out to sea and give enough time to warn countries in the region. However, the buoys are expensive to install and maintain. Unesco's Intergovernmental Oceanographic Commission (IOC) is also focusing on a network of tide or sea-level gauges. Unlike Dart buoys, tide gauges in the Global Sea Level Observing System (GLOSS) are sited on land, either on mainland coasts or on islands out to sea. The most basic form of gauges monitor the surface of the water with a system of tubes and floats (as shown right). More modern versions "ping" the surface of the water from above with radar or sonar; or use sea-bed pressure sensors attached to the sea-level observing station with a cable. There are almost 70 GLOSS stations in the Indian Ocean. Before the tsunami, they were used to measure the sea level for longterm climate change studies, and their data was transmitted only periodically. Now, the stations are being upgraded so they can send real-time data via satellite to newly set up national tsunami centres. They are also being fitted with solar panels so they can continue to operate even if the mains power supply is interrupted by severe weather. Map showing location of GLOSS sea level stations and when they are to be upgraded. Twenty-three stations should be fully upgraded by the end of June 2006, according to the IOC, and more will follow in the next few years (see pop up map). Seismic stations across the world registered the earthquake which caused the tsunami and global analysis centres realised that a big event was likely, but as there was no warning system in place this information could not reach people on the ground. Until the Indian Ocean system has been fully developed, centres in Japan and Hawaii are forwarding alerts to countries in the region. Twenty-five countries have signed up to receive the warnings. Perhaps the most important part of the tsunami early warning system is how to get the information to people who are in immediate danger. Primary responsibility for this rests with governments and most of the 27 nations bordering the Indian Ocean have been setting up individual programmes for issuing tsunami alerts to their own people. However, they have been so far unable to agree which country or countries will host the regional alert centres to process international technical data and issue warnings across the area. Thailand, India and Indonesia are forging ahead with their own systems and Australia, Malaysia and Singapore are planning to develop warning capacities. 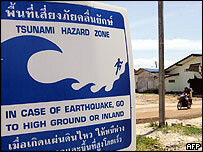 Thailand has opened a disaster warning centre which currently receives data from Hawaii and Japan. Alerts can be sent in minutes to national and local governments and the media. Thailand is also installing a network of 76 siren towers along part of its coastline and recently staged a tsunami simulation exercise for emergency services. India has also set up an alert centre which is monitoring data from seismographs and 11 tide gauges. Indian officials say a full system for the country should be in operation within two years. Indonesia plans to spend $125m on setting up its own tsunami detection system. The UN is helping countries with other long-term measures including teaching tsunami awareness in schools, training decision-makers and broadcasters, and making sure information is available in all local languages and staging practice drills. The most recent meeting of the UN's Indian Ocean Tsunami Warning System group also recommended mapping coastal zones to work out which locations are most at risk of flooding and to which areas it would be safe to evacuate people in the event of an emergency.